'Mythic Women installation at Hartnell College. 2016 includes prints from 32 women. represents a mythic woman for you? What are the qualities of an Mythic Woman? What would be the typical pose for that persona? 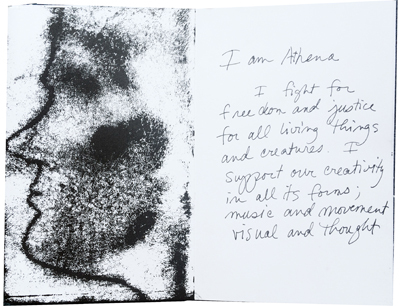 The Mythic Women project ignites reflection upon and a channel to connect with those who have inspired. I invite women to think about influential women figures in their lives - whether she be truly mythical, imaginary, literary, historical, or someone in their personal life. After an introduction to this simple, clean printing process through making a faceprint, with guidance participants make a bodyprint representing their inspiration. Ink does not touch the body but creates a direct impression by pressure onto the paper. 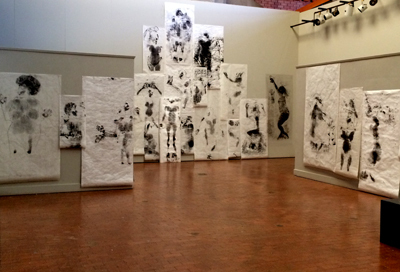 Through dialog and movement, we plan out each life-size print to invoke that potent spirit.